IT BEGAN WITH SIX STONES . . .
From the deserts of Israel to the tsunami-lashed coasts of Japan, from the steppes of Mongolia to the most mysterious island on Earth-this is what we have come to expect from Matthew Reilly: stupendous action, white-knuckle suspense, heroes to cheer for, and an adventure beyond imagination. 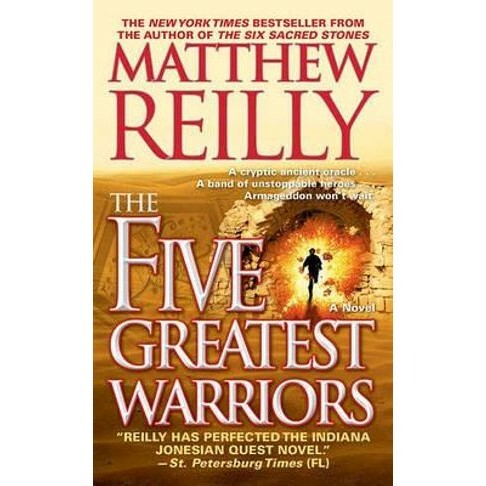 Strap yourself in and hold on tight as he unleashes his biggest and fastest adventure yet, The 5 Greatest Warriors. After an astonishing escape, Jack regroups with his trusty team. Racing to rebuild the final pieces of the fabled "Machine," they discover an ancient inscription containing a rhyme about five mysterious unnamed warriors-great historical figures whose knowledge will be vital to unlocking the secrets of the Machine and its long-lost "pillars." But the ancients have hidden their secrets well, and with each pillar bestowing an incredible power upon its holder, their pursuit has attracted the attention of other forces from around the world-some who want to rule it and others who want to see it destroyed. With enemies coming at him from every side and the countdown to doomsday rapidly approaching, Jack and his team had better move fast. Because they are about to find out what the end of the world looks like . . .
Matthew Reilly is the international bestselling author of eight novels: The 6 Sacred Stones, 7 Deadly Wonders, Ice Station, Temple, Contest, Area 7, Scarecrow, and the children's book Hover Car Racer, and one novella, Hell Island. His books are published in more than eighteen languages in twenty countries, and he has sold more than 3.5 million copies worldwide.